Teva Pharmaceutical Industries Ltd. is an Israeli multinational company headquartered in Petah Tikva, Israel. Teva (meaning "Nature" in Hebrew) was initially a family business founded in May 1935 by Dr. Günther Friedländer, a German pharmacist who immigrated to Mandatory Palestine in 1934, following the Nazi Party’s rise to power. Since then, the company has grown into the world’s largest generic drug manufacturer. Our goal with this article is to help companies looking to partner with Teva understand how and where decisions are being made within the organization. To accomplish this, we will give a brief business overview, provide some highlights about their outsourcing history and show the distribution of their global drug development sites and decision makers. Finally, we will close off with a summary of their strategies for innovation. At the end of 2017, Teva had 51,792 employees internationally. Their employee distribution is 24% in the United States, 43% in Europe, 12% in Israel and 21% over the rest of the world. The company is currently undergoing some downsizing and in a restructuring announcement at the end of 2017, they stated that they would be reducing their global workforce by 25% (14,000 positions) by the end of 2019 . Teva specializes in generic drugs, however a lesser amount of its business also involves the sale of active pharmaceutical ingredients and proprietary pharmaceuticals. They have a stand-alone unit called Tapi, which functions as a contract manufacturing organization for active pharmaceutical ingredients. Teva Company’s therapeutic areas of specialty are central nervous system (CNS) (including neurological and neurodegenerative diseases, pain, and movement disorders) as well as a strong portfolio of products to address respiratory disease. Gross profit for Teva in 2017 was $10.8 billion, down 9% compared to 2016. Half of Teva’s profits and 20% of their revenue comes from the sale of their patented product, Copazone, a specialty product for the treatment of multiple sclerosis (MS) . Copazone is the best selling MS drug internationally and accounts for 31.2% of total MS prescriptions in the United States. In 2017, Research and Development accounted for $1.8 billion in expenses for Teva (down 12.5% compared to 2016) . As of November 2018, their pipeline included 10 programs in Phase 2 through Registration . 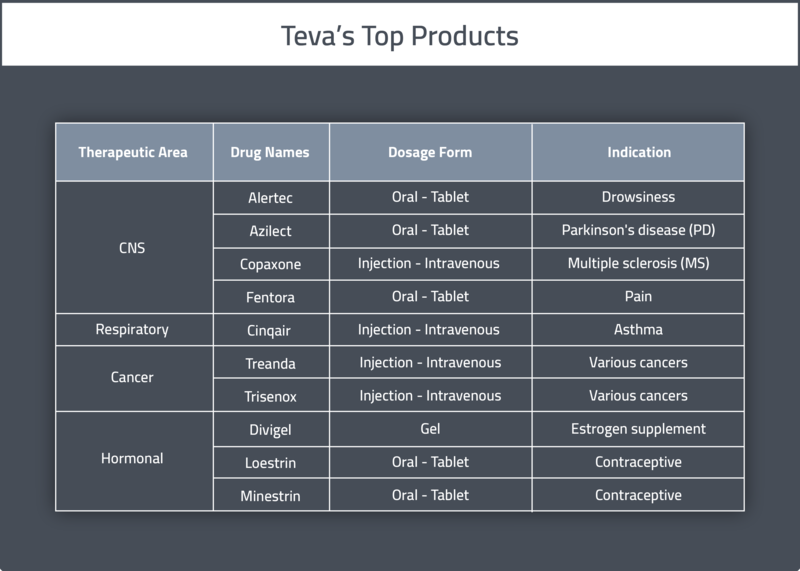 A table summarizing Teva’s main pharmaceutical products can be found below. Teva has a proven history of entering into development and commercialization agreements with companies who have promising investigational products. For example, in 2010 they signed a contact contract with Mersana Therapeutics to fund the development of their product XMT-1107 . Teva also has a history of outsourcing several different functions, such as sales, marketing, regulatory affairs, research & development, commercialization and manufacturing. They tend to favour partnerships when seeking to expand into new markets. For example, in 2012, Teva entered into its first alliance in East Asia by singing a contract with Handok Pharmaceuticals. Handok would expand Teva’s presence in South Korea by handling marketing, distribution and regulatory affairs for the region . Similarly, in order to enter the Indian market, Teva signed a product outsourcing contract with the New Delhi-based Ind-Swift Lab in 2013 . In light of their December 2017 announcement about their plans to restructure and downsize (including shutting down several of their manufacturing plants ), we can expect to see an increased reliance on outsourcing in the coming years. In line with this, the company has recently entered into a 10-year manufacturing agreement with Rekah Pharmaceutical Industry in Israel, where it plans to close its own manufacturing facilities . Do you have a Zymewire account? Click here to view all of Teva's global activity! As previously mentioned, the company’s global headquarters is in Petah Tikva, Israel. Teva Pharmaceuticals USA’s headquarters are currently located in North Wales, PA, but they will be relocating to Parsippany-Troy Hills, NJ. 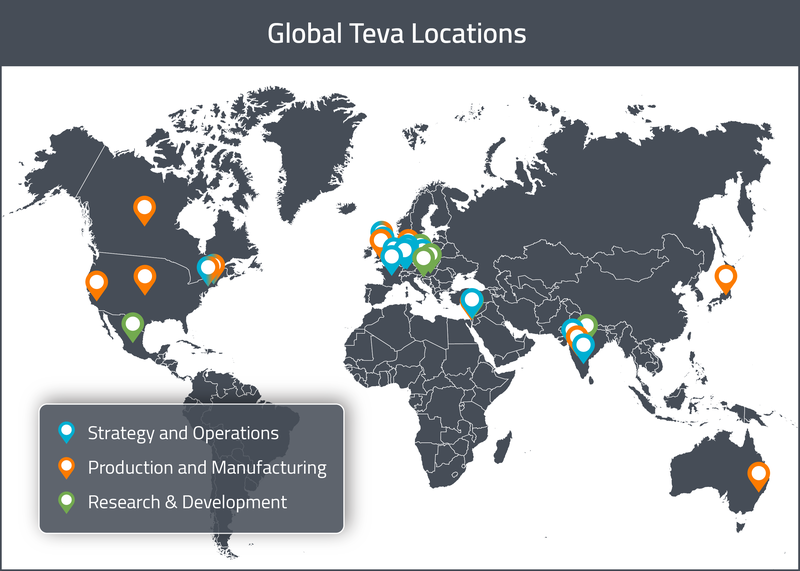 Teva operates R&D sites in the United States, Europe, Japan and other selected ROW countries. In 2017, their research facilities include four large development centers: a center in Israel focusing on synthetic products and peptides, a center in Hungary specializing in fermentation and semi-synthetic products and centers in India and Croatia, both focusing on synthetic products. 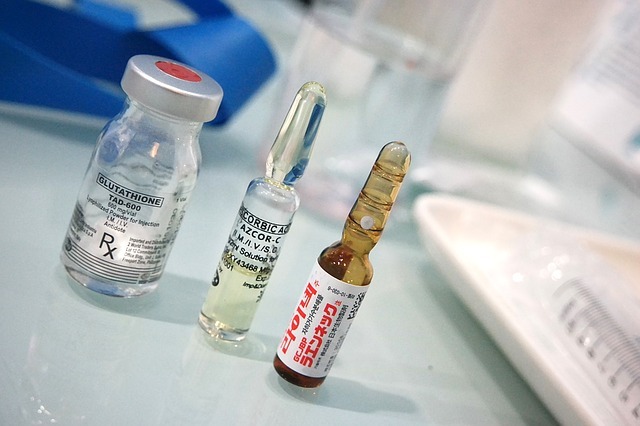 Three additional smaller sites are located in Italy, Mexico and the Czech Republic for development of high-potency APIs. 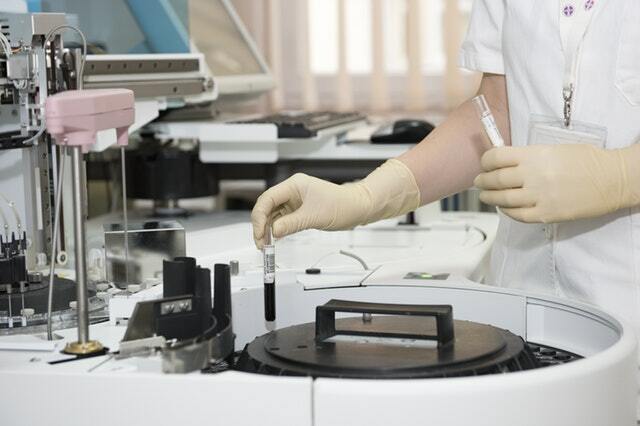 R&D efforts span from generic medicines (finished product and active pharmaceutical ingredients), to specialty pharmaceuticals, to innovation of existing molecules/products. In their downsizing announcement, they announced the intention to shut down a number of their R&D facilities globally. They are also thoroughly reviewing all R&D programs (including over 1,700 generic products in their pre-approved global pipeline) to prioritize core projects and terminate others. In 2017, Teva operated 68 finished dosage and packaging pharmaceutical plants in 36 countries and 19 API production facilities for a total of 87 manufacturing facilities . The majority of the company’s manufacturing takes place at sites in Israel, Germany, Hungary, Croatia, Bulgaria, India, Spain and the Czech Republic. Of their 87 facilities, 33 are FDA-approved and 30 are EMA-approved. In 2018, Teva reported producing 88 billion tablets and capsules and 720 million sterile units at internal facilities. In their downsizing announcement, Teva stated that they will be shutting down 20-25 of their manufacturing facilities globally by the end of 2019. A complete list of the company’s Pharma and API sites can be found below. Pharma sites: Canada (3), USA (14), Mexico (3), Puerto Rico (2), Venuzuela (1), Peru (1), Chile (1), Brazil (1), Argentina (1), Iceland (1), Netherlands (1), Ireland (3), Spain (1), UK (2), Poland (1), Italy (1), Germany (2), Malta (2), Lithuania (1), Russia (1), Serbia (1), Czech (1), Hungary (2), Romania (1), Bulgaria (2), Greece (1), Croatia (1), Israel (5), India (3), Japan (3), Thailand (1), Singapore (1), Indonesia (1). API sites: USA (1), Mexico (1), Puerto Rico (1), Ireland (1), Italy (5), Hungary (2), Croatia (1), Israel (3), India (3), China (1). Decision making has been classified into three sections: clinical outsourcing, manufacturing and logistics. This division should facilitate outreach efforts by different types of companies looking to do business with Teva. In general, North American decision making at seems to take place primarily in the Greater New York and Philadelphia areas. European decision making is more spread out, but Israel houses a high number of high-ranking decision makers. In Asia-Pacific, the clinical and logistics decisions appear to take place in India, whereas manufacturing decisions are spread out across India, Australia and Japan. In North America, clinical outsourcing decisions are based out of the Greater New York City Area (New York) and the Greater Philadelphia Area (New York). In the Greater New York City Area, there is an Executive Director of Clinical Research and Development. In the Greater Philadelphia Area, you will find an Associate Director, Clinical Project Manager, Clinical Pharmacology Trial Manager and a Senior Manager of Global Clinical Operations. In Europe, clinical outsourcing decision-making is split across Israel, Switzerland, Germany and France. In Petah Tikva (Israel), you’ll find the Vice President of Global Clinical Operations, Manager of Clinical Development and Senior Global Clinical Project Manager. In Basel (Switzerland), look out for titles like Associate Director of Global Clinical Project Management, Global Clinical Project Manager, Clinical Operations Manager and Clinical Trial Manager for Global Clinical Operations. The Ulm area of Germany is where you’ll find an Associate Director of Clinical Development and a Senior Manager of Biopharmaceuticals. Finally, in Paris (France), there is another Senior Global Clinical Project Manager. In APAC, decision making takes place in India, specifically in Mumbai and the Bengaluru area. In Mumbai, there is an Associate Director of Clinical Operations and a Director of Third Party Operations Quality. In Bengaluru area, there is a Director of Clinical Research. Where are their manufacturing decisions made? When seeking out manufacturing decision makers, make sure you keep and eye out for people on the Manufacturing Science & Technology (MS&T) team. This rule applies internationally. North American manufacturing decisions are also primarily based of the Greater New York City Area and the Greater Philadelphia Area (New York), with some decision makers also located in Orange County (California) and the Virginia Area (Virginia). In the Greater New York City Area, titles to look out for are Senior Director of Manufacturing Science and Technology, a Senior Project Manager for Third Party Manufacturing, and a Director of Manufacturing Science and Technology for Third Party Operations. In the Greater Philadelphia Area, titles include Associate Director of Manufacturing and Manager of Upstream Clinical Manufacturing. In Virginia area, there is a Manager of API Facility Manufacturing and in Orange County there is an Executive Director of Manufacturing. European manufacturing decisions are based out of Israel, Italy, Germany and the UK. Israel is where you’ll find the Senior Manager of Contract Manufacturing and Technology and the Senior Director of APAC and IL Manufacturing. Italy is the home of the Senior Vice President and Global Head of Manufacturing. In the UK, there is a Senior Director and Regional Head of EU & APAC Manufacturing located in Southampton and an Associate Director of Manufacturing Science located in Warrington. Asia-Pacific has their manufacturing decision makers split across Australia, India and Japan. In Australia, there is an Associate Director of Biologics Manufacturing Development in Sydney and in New South Wales there is a Director of Manufacturing Development. In the Karwar area of India, there is a Director of Manufacturing Operations. Finally, in Japan, you’ll find a Senior Director of Manufacturing. Where are their logistics operations based out of? For North America, decision making for logistics is once again based primarily out of the Greater New York and Philadelphia Areas. In the Greater New York area, look out for the Manager of Clinical Supplies Logistics. In the Greater Philadelphia area, keep an eye out for titles like Senior Manger of Logistics, Senior Manager of Logistics Chain, Vice President of Supply Chain Distribution & Logistics, and the Associate Director of North American Logistics/Commercial Operations. For Europe, there are several logistics decision makers spread out across Israel, Switzerland, the UK, Austria, Spain and Germany. 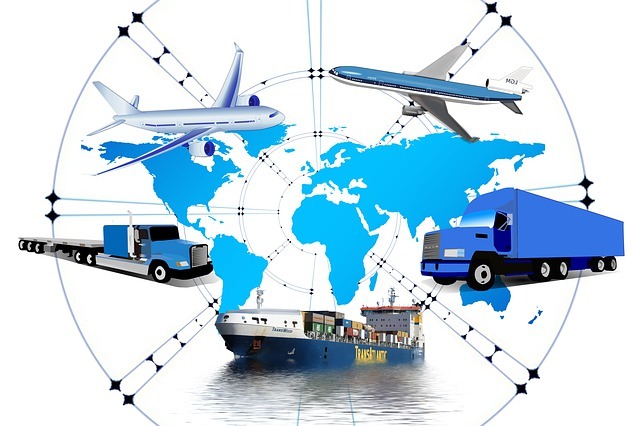 Starting in Israel, you’ll find the Associate Director of Logistics Process & Strategy (Global), Director of International Shipping & Logistics, Senior Purchasing Manager for Global Procurement, Global Clinical Study Supply Chain Manager and the Head of Supply Chain. Moving on to Switzerland, there is a Senior Director of Logistics for Europe PTC/PP and a Supply Chain Manager TAPI in Zurich. In the UK, you’ll find the Vice President and Head of Global Supply Chain Logistics in London and the Supply Chain & Logistics Director in Warrington. Austria has a Director of Market Supply Chain and Spain (Madrid) has a Senior Manager of Supply Chain. Finally, in Germany, there is a Senior Manager of Logistics in the Ulm area. For APAC, most logistics decision making seems to take place out of Mumbai, India. There, you’ll find the Associate Director of Indian Logistics. In order to foster innovation, Teva entered into a collaboration with Phillips Healthcare in January 2015 to launch an organization called Sanara Ventures. Sanara is a venture capital incubator committed to investing 100 million shekels ($26.5 million) over eight years into 40-50 medical device and health technology start-ups in Israel. This is the first partnership of its kind in Israel. Sanara Ventures is interested in ventures at various different stages in their development. Sanara Boost is the pre-seed program, Sanara Momentum is the seed program, and Sanara Scale is for maturing companies. As of January 2016, Sanara had received 400 applications and accepted four companies into their program. 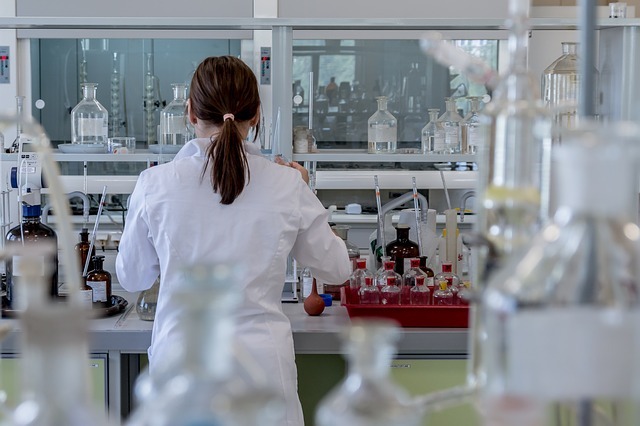 If you would like a simple solution for keeping an eye on drug sponsor companies, like Teva, without relying on a database and generic lists of leads each week, we at Zymewire are here to help. Reach out today, and stay tuned for the next instalment of Sponsor Atlas: Selling to the Pharma Giants. If you enjoy these articles, please feel free to give them a share through the social links below! To view Part 5 of the Sponsor Atlas series, Navigating Novo: A map for Selling to Novo Nordisk, click here!